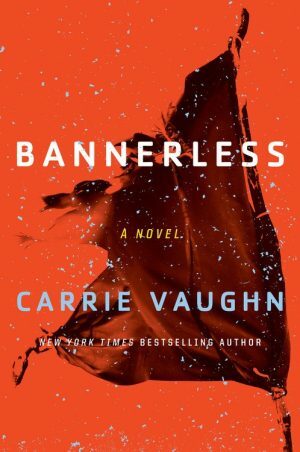 Earlier this week we saw the release of Bannerless by Carrie Vaughn. This is a murder mystery set within the framework of a post-apocalyptic world where every day it takes everything just to survive. The story unfolds in two timelines. The first, current timeline follows Enid as she works as an Enforcer attempting to solve a murder. The second follows Enid through her teen years as she follows Dak the musician around the countryside. The novel takes place on the west coast, the exact location never quite revealed. This is a future earth, a place where modern society has collapsed. A series of ecological disasters ravaged the land, the remnants of which still occur. Along with this was a series of terrible epidemics which killed off large swaths of the population. This sets up for a fantastic post-apocalyptic world, a place where humanity has banded together in small, tightly knit communities. There is strict birth control in an attempt to desperately ensure that there is enough food and other resources to support the town. This is a novel that is set up well and should have a lot to say on a wide variety of topics. However, the novel never really gets there. Not much is said on these topics. The world within the novel is explained rather thoroughly, but nothing is commented on. Enid doesn’t question the rules of her world, the framework upon which her society is set. No commentary slips through in the discussions between characters. Which leads to my next point. The blurb markets this as a dystopian novel. While it is most definitely post-apocalyptic, it is not particularly dystopian. The novel teeters right on the edge, but never makes the next step into that territory. Not enough is given to show us the pitfalls of how their society works, either in regards to population control or otherwise. Sure, we get a small glimpse into the harsh life those who’ve stuck things out in the dilapidated cities survive and how it differs from the life Enid knows, but we don’t really have enough to make a lot of commentary on it. And, again, the characters don’t provide a lot of dialogue – either inner dialogue or with each other – either. The tale told within the past was more of a coming of age tale than anything else. We saw Enid grow and change within that story. I found this the more intriguing of the two parallel tales being told. I liked seeing the post-apocalypse setting and learning how society and the world became the way it was. The mystery, on the other hand, fell a little flat. The whodunit aspect was predictable. I wasn’t at all shocked or surprised at the outcome of the mystery. While Enid had obvious character growth throughout the chapters set in the past, I couldn’t really say the same thing of the present day mystery story. Overall, Bannerless by Carrie Vaugn fell a bit short for me. I was looking forward to a dystopian, post-apocalypse murder mystery that asked a lot of a questions. What I got fell short of that mark. Still, the world in which Enid lives is quite intriguing, and I wouldn’t be against reading more by this author or other works set in this world. If you like post-apocalypse settings maybe give this book a read.